What can a humble fish tell us about our brains? Quite a lot, as it turns out. At first glance, the sleek, stripy zebrafish is very different to us mammals, but this four-centimetre-long minnow is enabling a revolution in neuroscience. Neuroscience is a broad field, with research spanning from molecular and cellular processes all the way through networks to behaviour and cognition. We are suckers for wanting to know which part of the brain controls certain behaviours, and how the brain makes sense of our environment. Although we have learnt a lot from the current workhorses of neuroscience, mice and rats, as neuroscience progresses we’re starting to ask far more difficult questions — some of which may be best answered by studying the tiny brains of the humble zebrafish. Zebrafish are no strangers to science. They have been used in developmental biology for decades and offer several advantages: they’re cheap, require little maintenance, and can rapidly reproduce. Zebrafish were even the first vertebrate to be cloned. Thanks to their widespread use, their genome has already been fully sequenced, which means they can also be easily genetically manipulated — an important tool for neuroscientists. Perhaps most essential of all, zebrafish are sufficiently similar to humans, both physiologically and anatomically, to be used as a model. While they’re still far off being mainstream, zebrafish have been gaining traction as a model within neuroscience since the mid 1990s. Compared to other small animals that are also used in research, such as worms and fruit flies, zebrafish are more similar to rodents when it comes to behaviour. With some modification, tests for social behaviour, learning and memory tasks can be modified from those used with rodents. Much of the pioneering work with zebrafish in neuroscience took advantage of their complex visual system. In one experiment to find out how a fish adapts to changing information, researchers placed zebrafish in virtual reality enclosure so they could control what they see. While computer screens placed around the enclosure showed the fish artificial environments, the researchers recorded their brain activity so they could determine how vision leads to specific behaviours. Visual cues like moving bands of light on the screens give the fish information about where they were in space and they responded to changes by adjusting the speed and direction of their swimming. Not content with simply flashing light at the fish, researchers even used these virtual reality enclosures to introduce other shapes that mimic predators or prey, to find out how fear or motivation affects their decision-making and subsequent movements. And what better predator to use in virtual reality, than swarms of aliens from Space Invaders. To make it seem like they were swimming through the swarm, the 3D alien images were updated in real time. The zebrafish responded to the aliens as they would real fish: they swam among them in the middle of the fishbowl as if they were part of the swarm. Although our daily environment might look at is quite different to that of a zebrafish, we also have to make decisions and change our behaviour in response to changing visual cues. Driving or cycling in traffic is a great example of when we might need to adapt our actions based on visual input — rather than swimming away from a predator, we may swerve to avoid a hazardous driver. Studying zebrafish can help us to understand how our brains make these decisions. Aquatic creatures have long been crucial to breakthroughs in neuroscience. Squid were fundamental in the discovery of the action potential, the electrical impulse that allows information to travel along neurons. In 1939, Hodgkin and Huxley first described the action potential using the squid giant axon, a huge neuron found in squid that can be up to 1mm in diameter. The axon was large enough for electrodes to be placed on either side of the axon membrane, allowing the pair to measure the voltage change. Because neurons function in the same way across most species, the work on squid allowed us to understand a key part of how our own brains function. This work won Hodgkin and Huxley a share in the 1963 Nobel Prize in Physiology or Medicine, and the mathematical models developed from these experiments still inform computational models today. These findings also laid the foundation for further Nobel Prize-winning research, and spawned the new field of electrophysiology, which explores the electrical processes of biological systems. Electrophysiology allows us to study the actions of single neurons, small networks of neurons, and activity of the whole brain. Other techniques, like functional magnetic resonance imaging, also give us information about the whole brain. But while we know a lot about the two ends of the spectrum, neither technique lets us clearly see how hundreds or thousands of neurons work together in networks across the brain to take on information, make a decision, and then react to the environment. Finding the answers to these complex problems of cognition, learning and memory requires new techniques to piece together our understanding of the brain between the neural and whole-brain level. New tools like calcium imaging are helping us do just that. A relatively new technique, calcium imaging allows scientists to watch activity across whole parts of the brain. Using specialised microscopes, we can use it to see neurons light up and brighten when they fire an action potential. This allows scientists to image activity of individual neurons within a whole region of the brain when they activate in response to information. This can even be used in anaesthetised or awake animals to determine how the brain reacts to their environment. Being able to do this bridges our knowledge between the individual neurons and the whole brain. But a rodent brain is large, and current microscopes can’t focus further than a few millimetres. This places limitations on how many neurons can be observed at once, restricting the bigger picture. This approach also requires a small glass lense to be surgically placed into the skull to visualise the brain. It would be much more beneficial to use an animal model that is small and ideally transparent, allowing visualisation of the whole brain. This is where zebrafish excel. Unlike their rodent counterparts, zebrafish larvae are small and translucent, and the adults can be made translucent with genetic manipulation. This overcomes the issue of only getting a window-view of one part of the brain, as the whole brain can be imaged in real time. 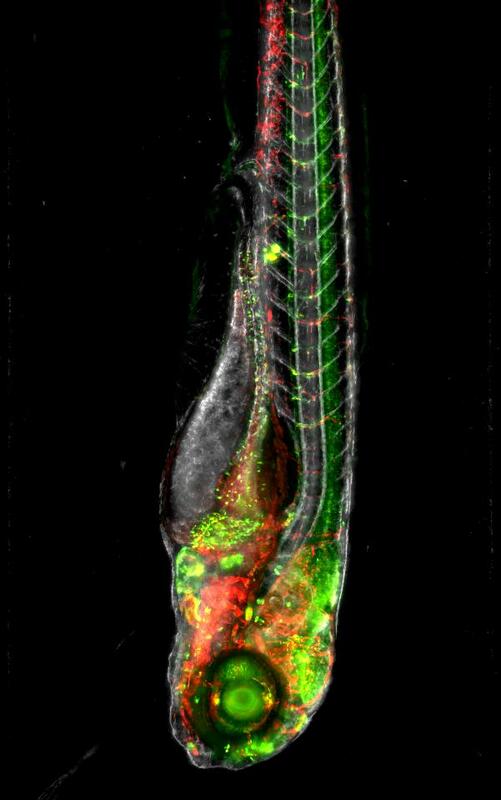 Whole-brain imaging of neuronal activity in a larval zebrafish. Courtesy of Misha B. Ahrens and Philipp J. Keller, Howard Hughes Medical Institute. Work published recently in Nature Methods pushed the boundaries of zebrafish neuroscience again. The researchers imaged the whole brain of freely swimming zebrafish at a magnification strong enough to see individual neurons. This work produced stunning footage of neurons working together with waves of activity rippling across the brain, and demonstrates a level of detail currently impossible to achieve using rodents. The goal of many neuroscientists is to understand how the activity of neurons leads to complex behaviours. Using techniques like calcium imaging in freely moving zebrafish gives unprecedented ability to observe networks across the whole brain. While the challenge now is to make sense of these data, we have the ability to connect complex behaviours like decision making with the networked firing activity of neurons across the whole brain.